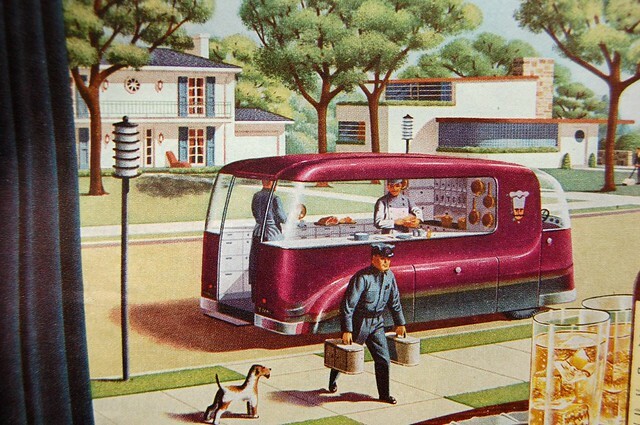 Urban food of the future, from 1940's Seagram's ad. Everyone eats. What we eat, how we get it, the cost of our food and where it comes from are questions for everyone. How do we plan our city with food in mind? Let’s talk about it together. Alpha Soul Café, 1015 Wellington St W.
Next City Café is a new monthly discussion forum in collaboration with Spacing Ottawa that explores the spaces, places and ideas that matter in Ottawa. Every 3rd Wednesday of the month, urban enthusiasts, activists, planners and residents will get together to explore, talk and be inspired to contribute to making this city’s spaces even better.